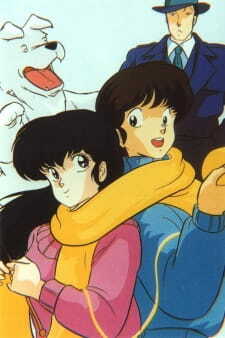 Rumiko Takahashi's Maison Ikkoku. Never have I seen anything as human as this. It was summer, a couple of years ago, when I stumbled upon an anime that seemed like it was an ancient artifact, a blast from the past. Because of how it looked (the quality's very worn-out), I almost dismissed it. Just like most of the people who do not give old anime a chance. I was fortunate enough because I decided to stick with the show for 96 episodes. After I watched it, I felt as though I just watched one of the best things that ever happened to anime. The story revolves around the old apartment Maison Ikkoku (even the apartment is old. Laughs). Yusaku Godai, room five's resident, together with Yotsuya, Akemi, and the Ichinose family, lives in it. The plot opens just as the old manager left the building. Suddenly, a beautiful middle-aged woman named Kyoko Otonashi (along with her dog) arrives, and tells them that she's their new manager. Yusaku Godai is not your typical perfect main character. He's a ronin, someone who can't pass college entrance exams. He lives on instant noodles, he has a lot (and I mean a lot) of pornographic magazines, his room has a big, annoying hole, and that said room is in a god-forsaken apartment. Heck, he doesn't even have money to buy underwears and he's also blessed with a couple of bumbling bozos for co-tenants. Don't get me wrong, though. He's a good guy, maybe the sanest one on the Ikkoku apartment (but he's not totally sane, he daydreams, and those daydreams he has are way crazy). But, there's no hiding it. He's the stereotype loser. If not for Kyoko, he probably wouldn't go to his entrance exams for the nth time. Ah, the manager, Kyoko. Since it's Maison Ikkoku we're talking about, it would not be complete without Kyoko. She's arguably the most complex character of the story. At first, she was a hot, steamy manager (according to Godai), looking as though she doesn't have anything hidden deep within her. But as soon as she starts talking to her dog, Souichiro, we are given hints that she's not just what meets the eye. She's a strong, independent woman, but she's a little on the indecisive side. Anyway, she's one character you can't help but love. I could go on and on for hours discussing about the supporting cast. You'd feel as though Rumiko Takahashi had spent much effort in putting life to her characters. Akemi is a scantily-clad woman who parades in the apartment with her seducing voice. She's a deep character too, but not as well-explored as Godai or Kyoko. Mrs. Ichinose is your all-nosy loud-mouthed neighbor, complete with Japanese fans. And Yotsuya.. I still don't know how to describe him. He's one of the supporting cast that I really liked, with all his mysteriousness and weirdness. Really, if you have watched this (or would watch this), you would know why. He's EPIC. Then, there's Coach Mitaka, Kyoko's other suitor, who defies the "stupid other love interest" stereotype. He's the complete, perfect foil to the spineless Godai. Later in the show, you'd see more. Grandma Godai will come, then Kozue, then Yagami, then Kyoko's family. And they're all worth mentioning. Each one affected the story in a way or another. Even the dog has its merits. The dub was well-done for all of them too. That's how splendid the characters of Maison Ikkoku are. Maison Ikkoku is a work with lots of genres all in one. It has romance (and a good, mature romance at that), comedy (OH, THANK YOU YOTSUYA FOR BLESSING THE WORLD OF ANIME), coming-of-age, and it deals with things such as finding jobs, moving on, and the importance of communication (misunderstanding is a vital part of the anime, most of the time funny, sometimes serious, and there's a lot of it. You'd drown yourself in misunderstandings). 96 episodes did justice to it. We get to be spectators as Godai tries to be a man for Kyoko. How he learns things are not as easy as they seem. We see how Kyoko contemplates with her past, how she grows, and how she develops her feelings. I wouldn't spoil you with the story. Watch it yourself, their bittersweet, sometimes crazy, always heartwarming love story. It's not an easy road, and sometimes you have to take the long way. All those complaints about the outdated art? You'd forget them when you see the tenants drink and have their merriment. And to tell you the truth, I kind of liked how it looked: it represents the times when you don't have much technology around but still feel as though life's good. I really felt I wanted to drink booze with them, to dance with Mrs. Ichinose, and to personally see Yotsuya balance sake bottles on his mouth. The music was well-done too (scored by genius Kenji Kawai). Talk about timeless perfection. The ending will make you feel complete, and could make you teary-eyed too. I couldn't sing enough praises for Maison Ikkoku. If you'd ask me to enumerate its most memorable moments, I'd probably never stop. Maison Ikkoku takes us to the most memorable days of our lives, where we fall, get up, and love selflessly. It made me want to live in the 80s. It will make you root for Godai and Kyoko as they make their way to happiness. This is perfection. This is Rumiko Takahashi's masterpiece. First, I want to make a note that the ratings for Art and Sound are somewhat tough to call for this particular series; it is definitely showing its age, the color is washed out, the animations are far from pristine by todays standards, but all of that given, there are inspired flourishes that, at times, challenge the stuff you see coming out of computer-aided studios today. When considering whether you are interested in watching this series, you should look elsewhere if you cannot answer "yes" to these two questions: "Am I patient?" and "Do I enjoy romance?". If you made it past that, you may find yourself enjoying this gem from the 80s. Maison Ikkoku primarily revolves around Godai, a spineless loser, who falls for the new manager of his apartment, Kyoko. Unfortunately for him, within the first handful of episodes, it is made clear (I won't say how), that Kyoko's heart is currently out-of-reach. Aside from the overarching romance, it is also a story about everyday life struggles: paying rent, working, going to school, making grades, etc. What it is most of all is the story of a young man getting beat down by life because he won't stand up for himself... and its downright hilarious. Constantly dancing on the line of poverty, Godai is surrounded by devilish, meddlesome neighbors, love rivals, and good-for-nothing friends. Even when he manages to avoid their pitfalls, his own indecisiveness usually foils his attempts at getting ahead in life. When he needs to study for exams, his neighbors invite themselves in for an all-night party, disregarding his pleas for privacy. When he is low on cash, his maybe-unemployed neighbor Yotsuya slithers in from a hole in the wall and steals his food. When he makes strides in his love life, rivals arrive to plunder his achievements. When all else fails, the electricity goes out, he arrives late for exams, or gets kicked out of his apartment. But to make things even better, despite the seeming maliciousness of all these characters, you'll find redeeming qualities abound, and often a hint of goodwill hidden underneath their malicious deeds. Take excellent situational comedy, hilarious and cunning characters, and pair them with the best veteran voice actors of the decade (check them out, you've heard them in some of your favorite shows), and you have a show thats hard to disagree with on an episode-by-episode basis. So its perfect then? Absolutely not. Despite all the praise you may want to award it, the show is long, tedious, and occasionally repetitive. Kyoko's inflexibility controls the pace of the show, and makes for some dramatic scenes, but you may find yourself shaking your fist in frustration over it more than a couple of times. Godai's inability to clarify even the most basic of misunderstandings is a source of humor, but again, will inspire no shortage of annoyance, and when Godai's two would-be girlfriends arrive and generate entire new dimensions of misfortune for Godai, you may nearly lose your patience with the series. But if you make it through that, if you can enjoy the humor, and patiently wait for the romance to work itself out, you will be rewarded greatly. Watching Godai grow as a character is hugely rewarding by itself, combining that with the resolution of certain issues on Kyoko's side, the conclusion of the series proves quite poignant with a lot less of the melodrama you'll get from today's romance anime. Jealousy, pettiness and spite have never been more beautiful. A lot of anime fans today don't seem to give series from the 80s a real shot, and that's really a shame. There's a lot of truly great storytelling from this era, and it seems to get dismissed because it "looks old". Maison Ikkoku is one of those titles, and it's a crime that more people haven't seen this. There's a real sense of humanity, tenderness, and subtlety in this series that really makes it stand out. It's a romantic comedy, but it's also so much more than that. It's a show about people, how we relate to each other, and how we live our lives. It's about growing up into adulthood, moving on after great loss, and the peaks and valleys in getting together with the love of your life. And the characters are wonderful - they are treated with such love and care by the series. Watching the last half of the series, particularly the last 12 episodes makes this abundantly clear- there is such subtlety and emotion in the character development in this show, that you want -all- of them to be sent off with hapy endings. Admittedly it's perhaps not for everyone. There's no gimmicks or fanservice, and the wacky hijinks, while certainly there (especially in the guise of Godai's neighbors), are somewhat toned down by today's standards. Younger kids probably would have no interest in this kind of show. Some may consider the art and sound a little dated (I graded the art and sound a 7 based on the standards of anime at the time). And 96 episodes may be a little long for some people, but for me it's 100% worth it. But if you want a show about people in their 20s and older (not kids or teenagers) finding love and growing up into adulthood, and want something a little less silly and a little more serious and mature in an anime series, Maison Ikkoku is the absolute perfect show for you. I find it a bit disheartening that most fans part of the "Rumic" niche are sometimes too focused on a lot of the hyped stuff and all the battles and action that come with it. I don't have anything against the new action series Rumiko creates or anything, but I feel that a majority forget that it was Rumiko's comedies revolving around romance that made her so well-known in the anime/manga world. The story focuses on Yusaku Godai, a struggling, daydreaming student that is resident to a rundown boarding house "Ikkoku-kan". Godai is constantly being tortured by the other tenants whose main purposes in life seem to be making his life hell and have drinking parties in his room on a daily basis. We have Hanae Ichinose, who probably loves consuming alcohol and gossiping more than life itself, Hanae's son Kentaro who thinks of himself as the only sane person in the boarding house, the peeping Mr. Yotsuya whose life is a complete mystery, and the redheaded, boozy bombshell Akemi Roppongi (who always seems to be hungover). When Godai feels that he's at his breaking point with these people and decides to leave, he finds that the old manager of Ikkoku-kan left, and the new manager has just walked through the door with her bags. The beautiful manager is named Kyoko Otanashi and has been recently widowed, looking for work. While the other tenants don't find her to be much of a big deal, Godai takes great interest in the new manager, falling in love with her instantly. The story revolves around Godai overcoming a lot of his personality flaws, like indecisiveness and being socially inept in some cases in order to prove himself worthy of being with Kyoko. However, like a lot of the pairings in Rumiko's works, there are twists in the pair's relationship and others get involved and tangled in some complicated messes. Like when Kyoko signs up for tennis lessons, the tennis coach Shun Mitaka falls for her also. He has looks, success, great ethical and financial background,...and is basically everything Godai isn't. This makes some complications for Godai and with two women that have their eyes on him as well as the nosy tenants miscarrying information, things get even messier. For characters, Rumiko has proven to be a genius with handling them realistically and diversely in each series she makes. Sure, you feel a little "sameness" with some of them (like Inuyasha and Ranma Saotome, with their transformation problems, attitude and all), but what makes the characters practically human with complex personalities and relationships with each other. The animation is about hte same quality as "Urusei Yatsura", which would be a little grainy and stretchy. But heck, this is pretty old, but the animation shouldn't turn people away from a gem like this. The story of "Maison Ikkoku" is very touching and cute. The characters are mostly likeable, the development and progress of the story flows nicely. It's no wonder it's considered one of the best romance animes by so many.